Confession: I wouldn’t have picked this up if I wasn’t working through every piece of Cormac McCarthy writing ever. This was the last thing left to read before I finish his oeuvre with the novel Suttree. 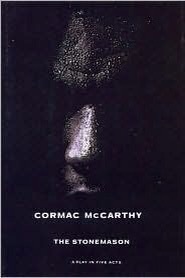 Screenplays or short works also haven’t been the highlights of this project, as McCarthy is at his best when he gets grandiose and epic, and there’s often just not enough time, so while sub-par McCarthy is still tremendously well-written I went into this with tempered expectations. The Stonemason is an interesting play about a black family in the States. The Telfairs are about to undergo an unavoidable, unpredictable series of catastrophes (like many of Cormac McCarthy’s main characters do). In theme, this was similar to many of McCarthy’s works: the degradation of traditional life, the value of physical work, all with death looming over every moment. The perspective of a black family means issues of race and time are at the forefront here: the more abstract, mental pains of the new age are contrasted with the physical oppression old, so societal progress is presented more evenly than in, say, No Country For Old Men. The Stonemason is above all earnest. The problems here are still enormously difficult to deal with, but they’re things nearly everyone experiences: death, money troubles, the ability to trust. Definitely one of the more heartfelt and the most subdued of McCarthy’s works, and it was an interesting change of pace.